See below for complete list of Belgian Sheepdog characteristics! 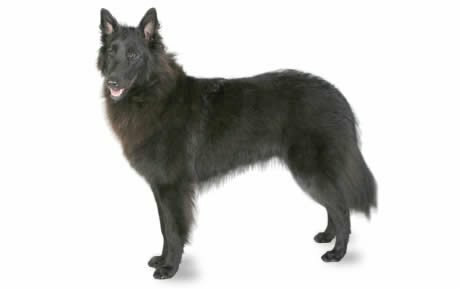 The Belgian Sheepdog (known as the Groenendael in Europe) is the solid-colored variety of the four Belgian shepherd dogs. Elegant and graceful, he has a long black coat and an imposing appearance. He's athletic as well as beautiful and maintains the working ability for which he was originally known, making him an excellent choice for agility, herding, and obedience competitions. The Belgian Sheepdog combines the versatility of a working dog with the gentleness of a family companion. He makes a wonderful family companion as long as he receives the exercise he needs. Of all the traits this breed has, energy is at the top of the list of what to consider before you purchase. The Belgian Sheepdog is not a breed that enjoys lazing around the house; he's a working dog and needs a job to do. Herding dogs such as the Belgian Sheepdog are hard-wired to chase after a flock of sheep all day long. That instinct doesn't disappear just because they're living in a family home instead. Expect to give him at least an hour of exercise per day. The Belgian Sheepdog is very intelligent and needs variety to keep from becoming bored. He's not a good choice for people who work long hours and have no way of exercising their dog during the day. If he's left to his own devices, he's likely to create his own entertainment — generally something you won't like that will be expensive to repair — or to develop separation anxiety. They do better in homes with a fenced yard. Their herding heritage makes Belgian Sheepdogs chasers, and they'll take off after joggers, bicyclists, and cars if they aren't contained by a fence. Loving and loyal, the Belgian Sheepdog will always protect "his" children, but it's important for parents to supervise play when neighboring children are around. The Belgian may mistake the noise and high spirits of play as an assault and try to nip at your child's friends. With proper supervision and corrections, you can teach him that this isn't appropriate behavior. Belgian Sheepdogs do best with children when they're raised with them from puppyhood or socialized to them at an early age. They can get along well with other dogs and cats if they're brought up with them, although they may have issues with strange animals that come onto their property. They love to chase — that herding instinct again! — so cats who stand their ground will probably fare better than those who turn tail and run. This versatile dog has many excellent characteristics, but he's probably not suited to a first-time dog owner. He's loving, loyal, and energetic, but can also be shy, sensitive, and strong-willed. When you put time and effort and energy into him, however, he's well worth all your work. Shyness can be a problem in this breed. Choose the middle-of-the-road puppy, not the one beating up his littermates or the one hiding in the corner. Belgian Sheepdogs require at least an hour of exercise per day. If you don't provide them with exercise and mental stimulation in the form of training or play, they'll find their own entertainment, and chances are it will be expensive to repair. Belgian Sheepdogs shed year-round and require 15 to 20 minutes of brushing weekly. Belgian Sheepdogs can get along well with other dogs and cats if they're raised with them, but they have a chase instinct and will go after animals that run from them. Belgian Sheepdogs will chase joggers, bicyclists, and cars, so they need a securely fenced yard. Belgian Sheepdogs are very intelligent and alert. They also have strong herding and protection instincts. Early, consistent training is critical! Belgian Sheepdogs are play-oriented and sensitive. Keep training sessions fun, consistent, and positive. Because of their intelligence, high energy levels, and other characteristics, Belgian Sheepdogs are not recommended for inexperienced dog owners. The Belgian Sheepdog is one of four varieties of shepherd dogs that were developed in Belgium in the late 1800s. The four varieties are the Malinois (fawn-mahogany, short coat with black mask), Tervuren (fawn-mahogany, long coat with black mask) the Laekenois (fawn, rough coat), and the Belgian Sheepdog, or Groenendael (black, long coat). The American Kennel Club (AKC) recognizes all but the Laekenois as separate breeds in the U.S., while the United Kennel Club recognizes all four types as one. The Club du Chien de Berger Belge (Belgian Shepherd Dog Club) was formed in September 1891 to determine which of the many different types of dogs was representative only of the shepherd dogs developed in Belgium. In November of that same year, breeders and fanciers met on the outskirts of Brussels to examine shepherd dogs from that area. After much deliberation, veterinary professor Adolphe Reul and a panel of judges concluded that the native shepherd dog of that province were square, medium-size dogs with well-set triangular ears and very dark brown eyes and differed only in the texture, color, and length of hair. Subsequent examinations of dogs in other Belgian provinces resulted in similar findings. The black-coated Belgian Sheepdog was developed primarily by breeder Nicolas Rose, whose kennel dates to 1893. The breed takes its European name from Rose's estate, Chateau Groenendael, outside Brussels. He purchased the breed's foundation dogs, Picard d'Uccle and Petite, and their offspring are the ancestors of today's Belgian Sheepdogs. The dogs were immediately popular for their versatility and were used as police dogs in Paris and New York in the early 1900s. In Belgium, customs officers patrolled the border with them. During World War I, they carried messages and pulled ambulance and machine gun carts. Their popularity in the United States increased after the war, and the Belgian Sheepdog Club of America was formed in 1919. The Depression era took a toll on their numbers, but they served as war dogs in World War II, and interest in them has gradually increased since that time. Today they excel in canine performance sports and rank 122nd among the 155 breeds and varieties recognized by the American Kennel Club. The Belgian Sheepdog male stands 24 to 26 inches at the shoulder and weighs 65 to 75 pounds, females 22 to 24 inches and 60 to 70 pounds. The ideal Belgian Sheepdog is smart, brave, alert, and devoted to his family. He's described as always in motion when not under command. His observation skills make him an excellent watchdog, but his herding heritage makes him naturally distrustful of strangers. If he isn't properly trained and socialized this distrust can lead to aggressive behavior. A well-socialized and trained Belgian Sheepdog is a confident protector of his people and property and doesn't attack without cause. He's affectionate and friendly with people he knows, especially family members. He's also demanding of their time and attention. This breed does not like to be left alone; he wants to be doing things with the family. He requires plenty of mental stimulation in the form of training and play, especially with puzzle toys such as Buster Cubes, as well as interactive play such as fetch games. This ideal Belgian Sheepdog temperament doesn't just happen. It's affected by a number of factors, including heredity, training, and socialization. Puppies with nice temperaments are curious and playful, willing to approach people and be held by them. Choose the middle-of-the-road puppy, not the one who's beating up his littermates or the one who's hiding in the corner. Excessive shyness can be a problem in this breed, so never choose a fearful puppy, even if he elicits protective feelings from you. Like every dog, Belgian Sheepdogs need early socialization — exposure to many different people, sights, sounds, and experiences — when they're young. Socialization helps ensure that your Belgian Sheepdog puppy grows up to be a well-rounded dog. Enrolling him in a puppy kindergarten class is a great start. Inviting visitors over regularly, and taking him to busy parks, stores that allow dogs, and on leisurely strolls to meet neighbors will also help him polish his social skills. Belgian Sheepdogs are generally healthy, but like all breeds, they're prone to certain health conditions. Not all Belgian Sheepdogs will get any or all of these diseases, but it's important to be aware of them if you're considering this breed. If you're buying a puppy, find a good breeder who will show you health clearances for both your puppy's parents. Health clearances prove that a dog has been tested for and cleared of a particular condition. In Belgian Sheepdogs , you should expect to see health clearances from the Orthopedic Foundation for Animals (OFA) for hip dysplasia (with a score of fair or better), elbow dysplasia, hypothyroidism, and von Willebrand's disease; from Auburn University for thrombopathia; and from the Canine Eye Registry Foundation (CERF) certifying that eyes are normal. You can confirm health clearances by checking the OFA web site (offa.org). Epilepsy: The Belgian Sheepdog can suffer from epilepsy, a disorder that causes mild or severe seizures. Epilepsy can be hereditary; it can be triggered by metabolic disorders, infectious diseases that affect the brain, tumors, exposure to poisons, or severe head injuries; or it can be of unknown cause (referred to as idiopathic epilepsy). Seizures may be exhibited by unusual behavior, such as running frantically as if being chased, staggering, or hiding. Seizures are frightening to watch, but the long-term prognosis for dogs with idiopathic epilepsy is generally very good. Epilepsy can be controlled with medication, but it cannot be cured. A dog can live a full and healthy life with the proper management of this disorder. If your Belgian Sheepdog has seizures, take him to the vet right away for a diagnosis and treatment recommendations. Progressive Retinal Atrophy (PRA): This is a degenerative eye disorder that eventually causes blindness from the loss of photoreceptors at the back of the eye. It is not thought to be widespread in Belgian Sheepdogs. PRA is detectable years before the dog shows any signs of blindness. Fortunately, dogs can use their other senses to compensate for blindness, and a blind dog can live a full and happy life. Just don't make it a habit to move the furniture around. Reputable breeders have their dogs' eyes certified annually by a veterinary ophthalmologist and do not breed dogs with this disease. The eye clearance the breeder shows you should be dated within the past year. Cancer: Dogs like humans can develop cancer. There are many different types of cancer and the success of treatment differs for each individual case. For some forms of cancer, the tumors are surgically removed, others are treated with chemotherapy and some are treated both surgically and medically. Anesthesia Sensitivity: Some Belgian Sheepdogs appear to be sensitive to anesthesia. It is important to alert your veterinarian to this possibility so he or she can follow the same anesthetic protocols that are used with sighthounds, including a pre-anesthesia physical exam and lab work, obtaining a current weight, careful administration of anesthesia, and monitoring the dog's vital signs during and after surgery. The Belgian Sheepdog is an indoor/outdoor dog. He should live indoors with the family but needs access to a securely fenced yard that will prevent him from escaping to chase passing cyclists, joggers, and cars. If possible, provide your Belgian Sheepdog with some off-leash exercise in a fenced area in addition to long walks or jogging. He needs at least an hour of activity daily, which can be broken up into two or three exercise or play sessions. He enjoys playing Frisbee and other retrieving games. If you like to hike or jog, your Belgian Sheepdog will be happy to be by your side. 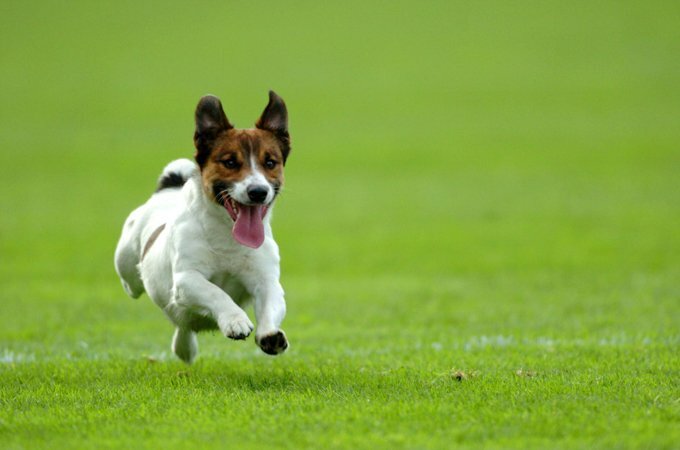 Consider training him to compete in obedience, tracking, or agility. It doesn't really matter what you do as long as you keep him busy. Don't be surprised if he runs in large circles in your yard; it's a remnant of his herding heritage. Introduce puppies to exercise gradually. From 9 weeks to 4 months of age, puppy kindergarten once or twice a week is a great way for them to get exercise, training, and socialization, plus 15 to 20 minutes of playtime in the yard, morning and evening. Throw a ball for them to fetch. From 4 to 6 months of age, weekly obedience classes, daily half-mile walks, plus playtime in the yard will meet their needs. From 6 months to a year of age, play for up to 40 minutes twice a day. Continue to limit walks to a half mile. After he's a year old, your Belgian Sheepdog pup can begin to jog with you, but keep the distance to less than a mile and give him frequent breaks along the way. Avoid hard surfaces such as asphalt and concrete. As he continues to mature, you can increase the distance and time you run. These graduated levels of exercise will protect his developing bones and joints. While the Belgian Sheepdog is smart and highly trainable, he is an independent thinker. To succeed in training him, you'll need to earn his trust and respect without the use of anger, intimidation, or physical force. For all his confidence and strength, the Belgian Sheepdog is sensitive, and his temperament can be damaged, sometimes irreparably, by harsh corrections. He does best with a combination of firm, fair, consistent rules and rewards for correct behavior. The Belgian Sheepdog is a double-coated breed. The topcoat is abundant with long, straight hair that's moderately harsh to the touch, never wiry or silky. The soft, dense undercoat provides protection from the weather and varies in thickness depending on the climate in which the Belgian Sheepdog lives. The hair is short on the head, outside the ears, and on the front part of the legs. Tufts of hair protect the opening of the ear. The hair on the rest of the body is long and includes long and abundant hair — called a collarette — around the neck, which is most noticeable in males; a fringe of long hair running down the back of the front legs and back of the thighs, and long, heavy, abundant hair on the tail. As in most species, the male is more ornamental than the female. The ideal Belgian Sheepdog is completely black or black with a bit of white between the pads of the feet, on the tips of the hind toes, or a small patch or strip on the forechest. You may also see a bit of frost on the chin or muzzle. White on the tips of the front toes is considered a fault according to the breed standard, but of course it doesn't affect the Belgian Sheepdog's abilities as a companion or working dog. Expect to spend 15 to 20 minutes per week brushing out that coat to remove dead hair and prevent mats or tangles. If you do this, you shouldn't have a lot of loose hair flying around your house, especially if you supplement the weekly brushing with a quick daily brushing of a minute or two. Grooming tools that will come in handy include a medium-size pin brush for long hair, a wire slicker brush for use on puppies and on areas of the body with shorter hair, a grooming rake for removing shedding hair, and a mat comb for removing the occasional mat that forms behind the ears or in the areas where the legs join the body. Like most double-coated dogs, Belgian Sheepdogs shed year-round with at least one heavy shed per year depending on the climate in which they live and how much coat they have. To get the shedding period over with more quickly, give a warm bath or two to help release the coat and brush more frequently. Some people save the fur and have it spun into yarn and made into sweaters or other items of clothing. Other grooming needs include dental hygiene and nail care. Brush your Belgian Sheepdog's teeth at least two or three times a week to remove tartar buildup and the bacteria that lurk inside it. Daily brushing is even better if you want to prevent gum disease and bad breath. Trim nails regularly if your dog doesn't wear them down naturally. If you can hear them clicking on the floor, they're too long. Short, neatly trimmed nails keep the dog's feet in good condition and keep your legs from getting scratched when your Belgian Sheepdog enthusiastically jumps up to greet you. Begin accustoming your Belgian Sheepdog to being brushed and examined when he's a puppy. Handle his paws frequently — dogs are touchy about their feet — and look inside his mouth and ears. Make grooming a positive experience filled with praise and rewards, and you'll lay the groundwork for easy veterinary exams and other handling when he's an adult. Well-socialized Belgian Sheepdogs are good with children, especially if they are raised with them, but because of their herding heritage they may have a tendency to nip at their heels and try to herd them when playing. You must teach your Belgian Sheepdog that this behavior is unacceptable. An adult Belgian Sheepdog who is unfamiliar with children may do best in a home with children who are mature enough to interact with him properly. Belgian Sheepdogs get along best with other dogs and cats when they're brought up with them from puppyhood. Sometimes they become best friends with cats and other animals and will protect them as they would members of their flock, and sometimes they all come to an agreement of mutual indifference. Belgian Sheepdogs can be aggressive toward other animals who aren't part of their family. If you want your Belgian Sheepdog to get along with other animals you must start early and reward them for appropriate behavior. If your Belgian Sheepdog hasn't been socialized to other animals, it's your responsibility to keep him under control in their presence. Belgian Sheepdogs are often purchased without any clear understanding of what goes into owning one. There are many Belgian Sheepdog in need of adoption and or fostering. There are a number of rescues that we have not listed. If you don't see a rescue listed for your area, contact the national breed club or a local breed club and they can point you toward a Belgian Sheepdog rescue. Below are breed clubs, organizations, and associations where you can find additional information about Belgian Sheepdog.